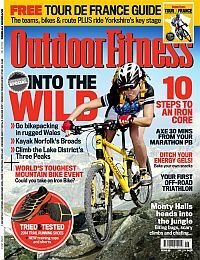 Welcome to Outdoor Fitness, Britain´s only magazine dedicated to helping you get fit and train for amazing challenges and events, all in the great outdoors. Each issue is packed with expert advice on how to get in shape and stay fit, alongside inspirational adventures. So whether you want to run a first 10K or take on a desert marathon, try a triathlon or ride 100 miles, climb a Munro or row the Atlantic, we´ll be with you every step and pedal stroke of the way. Our philosophy? "Life shouldn´t be a journey to the grave in which you arrive in a well-preserved body. Rather, you should skid there sideways, body thoroughly used up, totally worn out and screaming ´woo-hoo, what a ride´." So if you want to get out, get fitter and live life to the full, welcome aboard. Published in English - Monthly. Allow 6-10 weeks for initial delivery. For those with a passion for running, whether just starting out or experienced athletes, Running Fitness contains the ideal mix of information and advice to help readers get the very best out of their running.